Circles of knowledge and boundaries of ignorance. Mary and I worked together for a short time almost two years ago now. When we worked together I was impressed by her honesty, insight and wisdom. Here is a brief on-line interview she has done. It is focused on software development, but many of the ideas she discusses can be easily translated into other types of work. Oops! Servers down over the weekend! Sorry for the inconvenience, but it turns out a telephone cable was severed due to some nearby construction work. Fortunately, things are back to normal! Another interesting link for the morning: Appropriate Process. This is a small group of UK-based consultants who describe a clear and reasonable idea: use only as much process as is appropriate. They have a manifesto and set of values that are compatible / based upon the Agile Software Manifesto and the Extreme Programming Values. Well, this is interesting: Holacracy. It is a web site describing some aspects of an organizational system that sounds like a slightly modified Scrum of Scrums, with some electoral ideas thrown in, and a philosophy remarkably like the Agile Axioms. There are some very interesting ideas there. The fall schedule for Agile Project Management / ScrumMaster Certification courses has been posted on the Berteig Consulting web site. If you register through Agile Advice before Sept. 15th, you will receive a 15% discount on the course fee (this discount will be reflected on the course information display). The Beijing course is not available at a discounted price. Last December, I wrote about a nice simulation exercise that can be done in a small group to demonstrate the difference between waterfall, lean and agile approches to work. I have now run this exercise approximately 40 times and I would like to share the results. What’s Causing All These Problems? Siddharta Govindaraj has written a brief and useful reference article on the Five Pitfalls of Agile Adoption. One of his recommendations for avoiding these pitfalls is to address organizational culture. I strongly recommend the book The Corporate Culture Survival Guide by Edgar H. Schein. Chapter four of this book provides a simple and practical method of assessing corporate culture which I have used in consulting enagements to excellent effect. A few nights ago, I was having a conversation with my father, Garry Berteig, who is also an agile coach. He had an interesting insight based on a recent experience in Beijing: unity is a precondition to assistance. Does Process Matter? … No! Yes! Maybe! Now that I have described a way to think about team size and process levels, I can assert that the Agile community at the [Agile 2006] conference is mainly looking at the team-level process, even though many of the thought leaders claim otherwise. As I noted at the beginning, smaller organizations growing into enterprise organizations must change their processes, with the realization that Agile methods may not suffice at the enterprise or project levels. There are still spots available in this two-day course occuring on the 24th and 25th in the Toronto area. 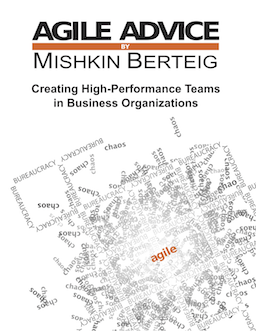 Details and registration information can be found on the Berteig Consulting Inc. agile course listings. Most of the teams and organizations I coach are working on using agile methods to improve their software development approach. Somewhere along the way, someone has realized that there must be a better way… either better than chaos, or better than bureaucracy. Over the years that I have been practicing agile methods, I have come to believe that quality is not negotiable.